Smallish, roundish, cutish and a little rough around the edges– these are my kiddos. 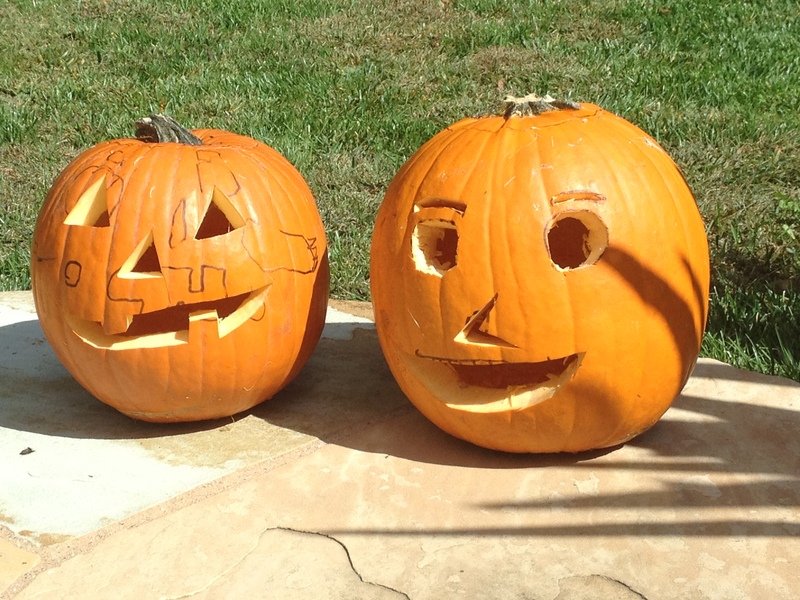 Oh wait, they’re actually their pumpkins. Happy Halloween from one very excited duo. Yes, we enjoy all that the season has to offer. Costumes, carvings and candy galore! I admit to dipping into the stash, and my kids know that they are required to acquire m&m’s for me. It’s like paying a trick-or-treating tax for which I am the collector. In the nutrition world Halloween wreaks havoc. It’s not the one night of gluttony, but the feeling for many that from here to the end of the year it’s one temptation after the next. Just the other day one of my clients panicked about a current trend and what it means for the holiday season: having alcohol causes her to loosen her guard and stray from her goals. From one unstructured evening she can tumble downward for several days until she can refocus. And so goes the cycle. The solution is easier said than done: don’t drink. I posed a challenge. Go dry for the season, as an athlete might when gearing up for peak fitness. It’s two months–not a lifetime. It’s not just a strategy to balance intake, it’s also a commitment to focus on goals. It’s a resolution to end the year on top of the game and not to begin the next by scrambling from the bottom. Hence the End Year Resolution. Don’t wait for the New Year to make plans and take action. Register for a race date in January, rather than waiting until January to identify one. And this goes well beyond nutrition and fitness, by the way. What can you do over the next two months to affect change within yourself? Within your family? Within your community? New projects to come in the New Year, and with that my blogging will take a different direction– to be decided in the End Year. Stay tuned! This entry was posted in Uncategorized and tagged Alcohol, Candy, Fitness, Halloween, New Year, Nutrition, Pumpkins, Resolutions, Weight Loss by Rebecca Marks Rudy. Bookmark the permalink. Can’t wait to hear what’s happening here! And now to resolve something of my own …. 🙂 thanks for the inspiration. Happy Halloween! Love the idea of an end-of-year resolution! Thanks for the inspiration!